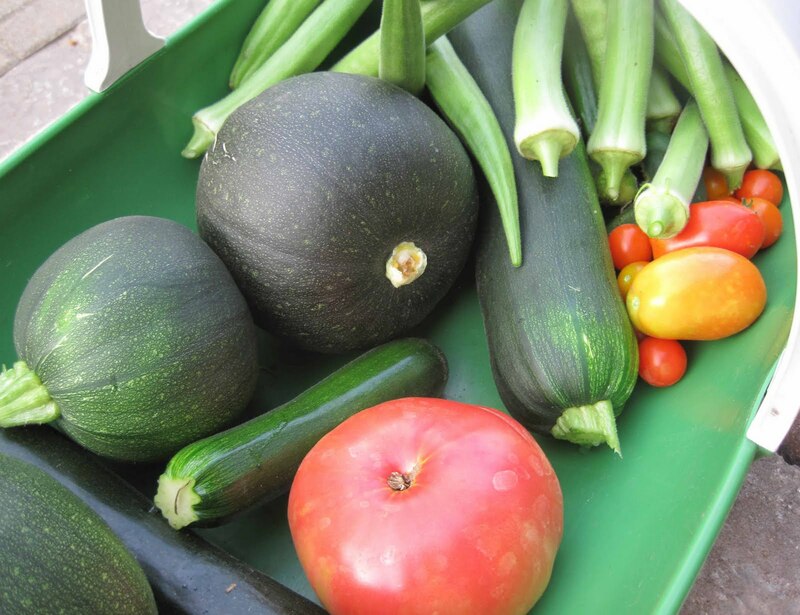 I am grateful to live and garden where I can grow vegetables, enough to make a dinner completely from the garden. Monday evening's harvest included zucchini squash, some of it slightly oversize, making it perfect for grating up for zucchini pie. There was also okra, ready to be cut up, soaked in water, coated in corn meal, and fried. And tomatoes, including the first big slicer of the season, a variety called 'Pink Ponderosa'. Not shown in the picture were tiny cucumbers, which when eaten straight from the garden, redefine how cucumbers should really taste. It doesn't take much more effort than scratching the earth with a hoe and planting a few seeds and tomato plants to come up with this harvest a few months later. We ate like this growing up, with produce from my Dad's garden. This simple fare defines a summer thanksgiving feast for me and will always remind me of family. What wonderful memories to be conjured by the produce produced by your own efforts, Carol. Grateful is good. The finest restaurants can't compete with the quality of a fresh garden harvest. It is truly a gift to be grateful for. I would like some fresh basil with your veggies though. I'm not close enough to share, you would have to grow your own! Sweet memories. I have garden produce envy. I think you left out the most important part of the recipe for a bountiful harvest -- good soil. I so long to see your soil and poke a finger into it. Does that make me sound eccentric? Nothing better than going out and picking something and eating it right away warmed from the sun - yum. What a wonderful dinner you must have had. You are great. And full. What could be better? I remember sitting under the peach tree ( for shade) and shucking corn or breaking beans. Fresh food at Grandmas was better than anywhere else in the world. We are doing the same....and yes, it does feel good and does bring back memories...and delicious too. All that work pays off. Did you try Celebrity tomatoes this year? Wonderful ! It looks and sounds delish, Carol! Such an awesome reward for your hard work! Congrats on the harvest!!!! Looks like you have been having some pop up thundershowers! Wonderful harvest. I like eating a meal from the garden too. But I have yet to really get that much in one harvest. I have to freeze harvests till there is enough for one meal. Such wonderful vegetables in your harvest. I have not grown squash this year, but do have tomatoes. I wish I could get okra to grow here, because I love it. That looks so fresh and yummy. Love okra and tomatoes! That's wonderful Carol, I'd like to be as grateful as you are next year.